"The thing I fear is that my husband and I will age very differently. It happened with my parents, but I don't think I have as much patience as my mother. I know I need to prepare to cope with an old man! Of course, it could go the other way..."
I think about what I call uneven aging, too. Though older (by 6 1/2 years) than Le Duc, I am—at the moment—somewhat fitter. What was once a vast, calm sea of middle age is now subject to storms. He had a heart attack a year after our move, and though now recovered, must manage his life differently. Our friends in their 50s to 70s are beginning to notice that they are aging at different rates. Either an age difference long unnoticed is now now apparent, or health issues have affected one partner, while the other ticks along. You don't have to be a couple to see the effects. Sue told me about a girls' getaway to a Mexican resort. There, it became clear that a friend now in her early 70s was having noticeable cognitive loss, something she could hide at home, but not there. If one partner's health suffers, suddenly your home must work differently. While Le Duc recovered, I was grateful that we now live on one floor. I thought of the advantage when we bought, but thought I'd need the ease first. Charlotte built a house with a second floor that closes when unneeded, with a master bedroom and bath on the first floor. Though in her 40s when it was built, she had aging in place in mind. Over the years, we amassed a collection of oriental rugs that my mother parted with as she faced increasing hazards to mobility. The other day I tripped on one. Is it my turn to pass them down? One friend's partner's condition makes getting out for long impossible. Technology gives us another way to connect. While Skype lacks the richness of face-to-face, it lifts some of the isolation. Some women, out of respect for their partner's privacy, restrict visitors. How much the infirm partner can tolerate varies, but if you have friends in this situation, ask if they'd mind if you dropped by for a quick coffee. Twenty minutes can really brighten a day, and who cares what the house looks like? When Anne's father, Don, was in his last months, she asked her mother, Nora, what was the best time of her long marriage "Right now! ", Nora exclaimed. "We have the most wonderful talks." Nora would listen to Don reminisce about each of his sled dogs, beloved companions during his childhood in the Yukon. "They would each have a glass of scotch in their hands—barely touched—for hours", Anne said, "but that was their ritual, and they stuck with it." Nora's long, close marriage still inspires and reminds me that you can only cherish the last stretch if you built such love in the preceding years. The diminished partner can feel crushing guilt. Lynn's father, Stew, told her at 88 that he was ashamed he could no longer keep up with Mim, his 67-year-old second wife. Mim, in turn, became short-tempered with him as a result of exhaustion. Lynn and her sister persuaded them to move to a retirement home in their city, a thousand-mile relocation. Until their father died at 92, they gave constant support. (I, in turn, provided many glasses of white wine to Lynn.) Their care saved that marriage. I've been thinking about uneven aging for awhile, having seen its various effects with my parents and their friends. Now, I'm seeing the first vestiges myself. We are beginning to talk to our family about our wishes, and have recently updated all legal documents pertaining to end-of-life care and intervention. But those are the tangibles; there is so much that is subtler. One of the most delicate is being open with partners and friends about the changes, both physical and psychological, and the accommodations required. I will appreciate your advice, and hope we can help one another navigate this unpredictable transition. There is much I'd like to say on this subject, since I feel like I'm working through my own fears about the issue. I have had chronic health issues (asthma, arthritis since the age of three) for many years, but they have really started impacting my quality of life now in my fifties. And considering my husband is a very fit, very active athlete, the differences are becoming much more apparent than they ever were. I'm addressing it by pushing myself to be as active as I can, within my limits, and possibly even pushing for a knee replacement to get some mobility back. I will never be an athlete, but I get frustrated watching all the action from the sofa!! 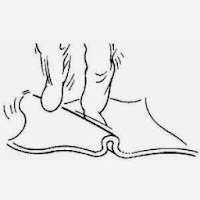 I can offer one piece of advice: we are also lovers of oriental rugs, and have found that cutting large squares of the non-slip latex grippy stuff (can't think of the term), and placing under the corners of the rugs, helps tremendously with slippage. My husband died 14 years ago at the age of 47 and I am now 61, heading into the future on my own. So my situation is rather different than yours. I applaud your level headed approach, recognizing that it needs to be talked about and plans made. So many older people I know, including my parents, didn't do that and were left scrambling. I wonder most about moving to an apartment at some point which you did. Right now I don't want to do that and am thinking of installing chair lifts if the stairs get too much. I'm trying to keep a realistic eye on myself, to know when and if I should make that change. Would you share what triggered it for you? Vivian Jung: You are one of the couples I had in mind, and also people who are not part of a couple will have friends in varying levels of mobility or health in general. I use those non-skid backing- helps a lot- but can still stumble over a rug if I forget it's there. LauraH: That's true, some couples face differing health issues or an accident, in far younger years. 2. a unit in a building with either interior stairs or an elevator. So many of our friends talk about keeping their large family home for visiting children and grandchildren. I've never thought that this is is the best plan. At the same time, I haven't been able to find a suitable smaller place for us to live (with our beloved dog) in spite of several years of looking. One issue is that my husband would have to be enthusiastic about a move--and he is not. I think time will tell whether we will age unevenly or somewhat alike. We are one year apart in age, and, at the moment, have about the same level of health issues. I will be most interested in the comments of others. Oh gosh. I could write a book on this. Not a well-researched one, at least not now, but a personal memoir on parents, step-parents, and the great support siblings can be to one another. But I won't do it here:). Because my mother is suffering from dementia, which gets worse month-to-month, and because she and her husband did choose to stay in their house that has been large enough for multiple family reunions, I see first hand the issues with that strategy. They lived 5 hours from some of their kids, and an ocean away from others. I absolutely understand why one wants to make those long visits possible, and it's been a wonderful, wonderful tradition and privilege. But it's probably not the best choice for the years of the frail elderly. I welcome anyone else's stories, if only for moral support. We already live in an apartment but as I age, I become more aware of the need that I have for community. If one of us were to become less mobile, there are social gatherings and exercise classes on-site. Our neighbour whose husband has developed dementia, has a number of people (neighbours) who can come to visit with hubby when she goes for a walk. We all age at different rates so it is difficult to plan but I believe that as we approach the 8th decade (or before)we need to have the conversation. We are still in early days of transition to our next phase. So far, we're both, in our early 60s, in good health and fitness, and we love our island lifestyle and beachfront home. But although I'd always imagined staying here into our 70s (yes, for the grandchildren), we now think we'll move into a central, urban condo within the next few years. First, I'd like at least a year to enjoy our island home in my new retirement, but logistically, it can be a bit demanding and the kids all live in the city. My mother did so well, even with cognitive impairment, in her city apartment with shopping, library, parks, doctor and dentist all within easy walking distance. I think it's a good model for uneven aging as well, as the one partner who's more fit can get out for a bit of a break, stipulations, company, etc. without having to be away long or going too far afield. A great service you provide in hosting this conversation. Challenging terrain, this. Good to talk openly about it. That should be "stimulation," rather than "stipulations"
Mim at 67 was encouraged to live in a retirement home? Her loving spouse turned her into an old-old woman way before her time. A caveat, nothing ages a person faster than marrying someone much older than yourself. Susan: I think it's a good strategy to casually look, if only to learn what's out there. Things can change quickly, not to sound gloomy, but I've seen it firsthand in both of our families. LPC: A friend's parents, the B.s, "downsized in pace" by both redesigning and reconfiguring rooms so that they lived on one floor, keeping the top closed until guests arrived. This was a costly alternative but they could afford it, and they were very attached to the home. They also hired home-care personnel, an option not available to all, but again, one they valued. Eventually Mr. B. died, and a daughter moved in to stay with Mrs. B., who survived six or seven years longer, to 100. Mme: Yes, we do need to have it, even if we are not yet sure of our preferences or even if our children (if we have them) don't initially like our choices. materfamilias: Yes, and your mother had such loving attention from her children. I think of one of my neighbours, who lost her husband (suddenly) and adult son (knew it would happen, but hoped) in the same year. She says it is very good for her to live "in the middle of a busy community" because the companionship she counted on within the family is suddenly gone. She is 63. Murphy: If I had a nickel for the adult children who have had to cull their parent's possessions, either for a move to a retirement home, nursing home, or as part of winding up the estate. I can think of only one person who actually enjoyed the work. Good to start with yourself first. Anon@ 12:04: No, he did not turn her into "old-old". They had moved many hundreds of miles to a new city where they knew no one except their daughters. Their retirement home was in the center of the city. In that home, they had a private apartment with a full kitchen, no different than a normal apartment. They were able to find convivial companionship virtually impossible to strike up had they lived in an apartment building, and neither wanted a house. They were not solely dependent on their two daughters for all social interaction. So "Nothing ages a person faster than marrying someone older than yourself"? I will have to ask my husband if he agrees, and am hoping not! Wendy: I am all for enjoying what you have and for doing what gerontologists call "aging in place". However, I also urge women past 50 to think about what they want, whether partnered or not. I have seen some older adults make ill-thought-out choices, when, in the course of a day or a few months, everything changed. Even if your friend died at 60, I think she was right to consider the issue in detail. We are a couple who, in our seventies, live on the lake outside a small rural community in Ontario. In town, we have a beautiful little hospital and two grocery stores, We are on one floor and love our home. BUT, what happens if one or other of us cannot drive any longer? And what happens if one or other of us gets a medical condition that requires city facilities? We are planning to move back to the city without too much delay. The question is where to live! Need to be able to walk to the grocery store. Need to know that condo fees won't bankrupt us. Need easy access to our new dwelling. The list goes on.....there are no easy answers! A very important topic with lots to think about! I've been thinking about these issues and will try to formulate a more comprehensive comment, but this is for Kamchick. I have a friend (widowed) who did the opposite move, from Toronto to a smaller and cheaper city, but the latter is a university town, and there is a decent public transport system and most things in the centre accessible on foot. Another closer to here moved to Sherbrooke Québec, where there are two universities and two Cégeps (one French and one English of each), which has a teaching hospital and very good bus service as all students are signed up de facto for a transport pass. The academic presence also means more cultural activities than usual for a city of its size. Kamchick: I am grateful to have someone a bit ahead of me chime in, here. We actually thought of moving to Hamilton. It's an easy commute to Toronto but way cheaper, has transit, the culture lagatta refers to (b/c of McMaster), and proximity to upper NY state, an area we enjoy. We looked around a bit there and saw some very appealing housing. But in the end we chose Montréal, which was right for us and closer (instead of farther) from Le Duc's family- and we can live handily without a car! But I thought Hamilton had a lot to offer. I'm not suggesting it's the only option but I agree proximity to hospitals and related services is important. lagatta: Some people are open- even welcome- a geographic move while others abhor the idea; it's a complex problem, isn't it? I will say that my father-in-law moved in with us last year. We "downsized in place" and rehabbed the basement; it's now a sweet little apartment. At 93, he's still able to drive and cook for himself. He also can negotiate the internal stairs (we will put in a chair lift when/if that becomes necessary). So far, we are looking at Ottawa for our re-retirement. We have family there and also we see the advantage of the VIA train, the Ottawa Airport which we are already familiar with and a good transit system. Ottawa is probably a larger city than we would like, yet it has some practical neighbourhoods. Still, we are open to suggestions and want to make a great decision. So much to think about. I was always asking my mother her plans and trying to persuade her to think long-term and relocate closer to us, but she always said 'oh, I'm not going to be old'. She suddenly became seriously infirm (mentally and physically) and has now been effectively housebound for over a year, being looked after my stepfather and a live-in carer - but a 12-hour flight (well, two flights) from me and my brother and her grandchildren ... I hope to take a lesson from this. Jean S: Living with family was once the only option; other arrangements were rare. Fortunate for all of you that you could repurpose the space. Kamchick: There are many areas of Ottawa in which you'd have little sense of being in a bigger city. We rented a short-stay apartment in one of the neighbourhoods we liked and lived as locals for several weeks, which gave us very useful information. As soon as you mention a place you're thinking of, people give you their opinion, and many had very little to do with •our• interests and values. I'd say I would not need one hand to name those who listened to our perspective instead of projecting their own idea of where to live. But then, the idea of moving to Quebec (from Ontario) does that to people. Tiffany: Your mother's remark is one I've heard before, often delivered with a wink- and that's fine while the speaker is in good shape. It's a major reason why I write about this topic. A friend of mine here will soon move back the the western US (where she lived till her 30s, when she married and moved here.) She has been widowed for decades. She will live in a small town about a half-hour from her two children, who live in a large city. She's a super-fit 70 year old. But she said, "I want to move before it's too big of an adjustment and while I can still make friends." Thank you so much for addressing a subject that I've never heard discussed before, though I've often thought about it. My husband and I--we're both 60--have all four of our parents living. His parents are still fairly independent in their 90s, while my parents, 87 and 89, are not (my mother is totally dependent for all aspects of life, my father is somewhat better). I fear that I will age far quickly than he will. Thanks for bringing this issue out of the closet in general and mine in particular. I have been thinking about these issues for a while now, but have not gotten very far yet. Mr FS and i watched both sets of parents make very different choices; neither choice is one we would make for ourselves. As for the "uneven" issue: In my mother's circle (she is 84 and widowed), men are in very short supply. Many acquire much younger girlfriends/wives who end up in caretaker roles. Thanks for writing on this with your usual thoughtfulness and thanks to the many who have responded. Much food for thought. Maggie: Thank you, and credit really goes to Val. Readers contribute some of the most original ideas here. frugalscholar: When we see other's choices and disqualify those, or aspects of those for ourselves, it is definite progress. Sometimes you have to begin with "not that". Your remark reminds me of my mother, who was widowed at 84. When I asked her if she might possibly remarry (she had a man showing real interest), she said, "No. At this age men are interested in only two things: nurse or purse." Duchesse: laughing at your mother's remark. My best friend's mom was widowed at 48. She never remarried or even dated. 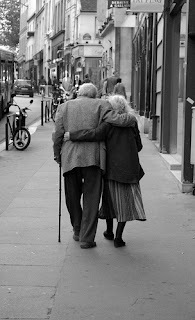 When asked about it, she said, "I don't want to spend my life taking care of some old man!" I'm 58 and my husband is 59, with kids in college. My mom lived with us after my dad died; we built an addition for her, because our guest room was upstairs. So now we have a large, 5 bedroom home. We have just paid it off, and think we'll stay here for a while, because Hubs is still working, the girls are in college, and we have lots of friends in the neighborhood. Yes, the house is way too big, but we think about retirement and moving to a place where we know no one, and have to start all over making friends. Staying here seems way better! I would also like to live near my children; I left home after college, and although I probably would do it again, I regret only seeing my parents two or three times a year. Of course, I have no idea where my kids will end up! So for now, we're staying put. My Aunty is 83 and her husband is 87. When they bought their current house (near me) about 8 years ago, she said she liked it because it was walking distance to the grocery store and the liquor store; her version of "assisted living!" My husband is 62 and I just turned 60. We are in the throes of this discussion, and it is often heated. He cannot wait to sell our family home, retire, and live full time on Cape Cod. I love the Cape, but never want to live there in the winter and want to have the "grandparents" home for the children to visit. My oldest just had our first grandchild, my sisters all live in this town, and my son is an hour away. Unfortunately, here in New York, we can only "retire" if we move into a small apartment, also not an option. I never considered that we would have such a division in our ideas of what the next chapter of our lives would be. It's very stressful. Large rambling house, in a much loved neighbourhood not far from downtown Montreal; children gone and no grandchildren yet(how late can they leave it? ); reaching 70 and 71. Last year we made the decision to sell but we are not ready to settle permanently yet. Both of our young people are working in London, UK. So we dispersed a lot of our belongings and moved to the UK where we are renting a small flat and are enjoying all London has to offer as well as travelling in Europe. There is nothing like a trans-Atlantic move to help you focus on the few things that it is essential to keep (mainly books and pictures) and to be hard-hearted about getting rid of the rest. And the result is that we feel lighter and much more free. When (if) we come back to Montreal we will look for an apartment closer to the centre where we can age in place within a walkable neighbourhood. JillAnn: It is ever more unusual for children to spend their adult lives in one location so it is always a 'guesstimate' where to live. And maintenance costs on a large home look rather different once you have no income- though it may not be an issue for you. Loretta: We lived in the same house for 25 years, and for at least 23 I swore Le Duc would never accept a move. But he saw the renos (to 4 storeys!) we had done over the first decade wearing out, and the cost to re-reno so much more than the original. He began to see the sense in a smaller house. Then I got him to think about a condo (ours has very reasonable maintenance costs). A friend's relative has lived full time on the Cape since retirement; she complains continually that her friends never visit. (Many of them no longer drive). It's not nearly as easy for them as when she lived on Beacon Hill and a few of them have told her, What did you expect? She gets blue in the winter and then complains about the tourist hordes all summer. Maybe it's her personality. Araminta: I have retired friends who sold their home and spend time in London too (their son is there) but spend the required period in Canada to ensure their health coverage; this winter, they have rented an apt. left vacant by snowbirds. It's a great adventure when you're willing to take the leap. How does one find an apartment for the winter vacated by snowbirds? That sounds like a possible good 'test' for us as we think that moving to Ottawa might be our best solution? The snowbirds had placed an ad in the community paper and my friends responded, met them and supplied references. Several other ideas come to mind: looking on Vacation Rental By Owner (www.vrbo.com), placing your own ad in a paper in the local where you want to be, and registering on trustedhousesitters.com. I have also seen 3-4 month seasonal rentals (for Mtl properties) on AirBnB. My friends pay a reasonable rent; it's not free. Kamchick: That is "locale", I just couldn't let that slip through. I am very interested in the age in place choice. I am assuming it requires being able to walk on foot to buy groceries etc. What happens when you are not able to do that? What is Plan C? Susan, in my walkable neighbourhood I certainly see people doing errands with rollators and in wheelchairs, but obviously physically disabled people need more help. A lot of nearby grocery stores here deliver, which is a big help. There are also public services that help people take care of their homes, but they are underfunded and overburdened. Obviously there are all kinds of disabilities, in kind and in severity. This is a somewhat different topic, but in Canada the Supreme Court has ruled that assisted suicide is legal (and legislation must be drafted). Susan: I imagine you do know the options if one cannot stay in one's home; what you may one day choose is a matter of personal preference, circumstances (including means) and- at least based at what I saw in my family- one's ability to make a good decision and if that turns out to be unsuitable, the courage to revise it. lagatta: I see that as a natural extension of this topic. One of our friends recently expressed his sincere wish to die after many years of excruciating illness (and no hope of improvement) and received full support from his family and the health care providers. This is part of the conversation we are having with our adult children. Now, in these changing years (I'm 75, he a little older) we have many of the usual adult afflictions, but face them as best we can. I think what is important is to have one's finances in order, before retiring, along with appropriate trusts, etc. (My parents, in their 80s, had a trust made out, including the Living Will component, which eased not only their final days, but also the settling of the estate, for my two sisters and myself.) The ease of their having the trusts helped us make sure that ours were in place. So, retire when you are ready and when you are ready, retire! I enjoy my days doing a variety of things, including sewing, making jewelry, some traveling, playing golf, going to the gym, etc. I also enjoy being online and am a Pinterest lover! We have lived in our home for almost 30 years now, and if the need arises, we will have care, rather than going to an assisted living home. But, that is an option, if needed. Best wishes to all of you in your pursuit of having a wonderful life, however you wish and plan for it to happen. Susan: Re aging in place once you become less able/mobile. If you are in Quebec there is a tax benefit you can claim to cover some of the costs of the services needed for independent living (house cleaning, laundry, household maintenance, help with personal care etc) It is cheaper for the government than providing state funded retirement residences. My late father-in-law made use of this. You need receipts of course. It is worth enquiring about whether something similar is available elsewhere. Wow! Very poignant subject. You've given us lots to think about. It's difficult to accept that we don't have control over so much in our lives. Some of us will become mentally or physically incapacitated regardless of the efforts we make to counter that. We can increase or decrease our chances, but in the end, it's the luck of the draw. Kirsten: Your position sounds like a relatively secure one from which to consider these issues, and I wish that were so for more women. Yes, putting comprehensive, honest management into your financial life is wise, and gives you peace of mind. We are fortunate in our community (university city of about 400,000) to have an organization that is part of the Village to Village network (http://www.vtvnetwork.org). These virtual "villages" provide resources to help people stay in their homes as they age. The NY Times has a recent article: http://www.nytimes.com/2014/11/29/your-money/retirees-turn-to-virtual-villages-for-mutual-support.html?_r=0 These are in the States, but I bet Canada has something similar. I've noticed that assisted living is often chosen in cases when the partner who performed the majority of the domestic duties can no longer do so (if they can afford that option). They also value amenities like on-site medical personnel. The best of such places looks and feels like an apartment, with discreet assistance for a range of needs. I'm fascinated by some I've read about that are placed, like one in Toronto, so that the residents are not segregated. The pace in Toronto occupies several floors in the same downtown building as with university housing. There are various support agencies and resources available in Canada, as well as universal health care, though the system does fully fund every procedure or drug. Several friends who are from East Asian and Middle Eastern cultures say they and their parents would never dream of any other approach than having their parents live with them if they can't manage on their own. My purpose in this post was to raise the issue of "one person okay, the other grappling with health problems", and now to address that imbalance, which can be sudden and emotionally fraught. Anon@ 3:56- Racing to post, I wanted to write" though the system does •not• fully fund every procedure or drug". For example, outpatient physiotherapy is not covered. Uneven aging isn't always physical. I looked forward to traveling after we both retired, but my partner has become a homebody. My married friends would rather travel alone or with another couple. My single friends want to go to Vegas or on a cruise; I'd rather be hiking in nature. Finding a sympatica travel buddy isn't easy. materfamilias: I had prepared a "vacation notice" post, then forgot tho publish it. Thanks for caring. I'll be back as usual next week. This has certainly struck a chord! A complete aortic dissection four years ago has changed the way my husband can manage a large house. It also made me think about the time to come when he will no longer be able to drive. We lived in the country, and in October moved into town, to a smaller house within walking distance of everything from bakery to library. Sometimes I wonder if an apartment mightn't have been a better idea, but neither of us was ready. For now this is a solution that meets our needs. As I think about hiring handymen to do all the things my husband did so quickly and easily I begin to think of the convenience of condo living, but for now the smaller house and yard are manageable. Pondside: From what I've observed, adapting by moving in stages can work well. It's the persons who have never thought one step ahead who can face pressure to make snap decisions. At one point I thought I could never, ever convince Le Duc to leave the large house where we spent 25 years, and I am grateful he was ready before it was absolutely necessary. Pondside: Also wanted to say: mature persons go on about the maintenance fees in a condo. But since neither of us were very handy and had issues like trees that needed to come down, foundation leaks, shifting stone garden walls, etc., we spent a lot on maintaining the value of the property. Now we rent our parking spot, which pays over half the condo fees. We bought in a building with reasonable maintenance and few amenities. The building is impeccably maintained, and therefore adds to the value of our unit. Though there are considerations with condos, I find people underestimate what it costs to maintain a home to a very good standard. Thank you so much for this wonderful conversation.